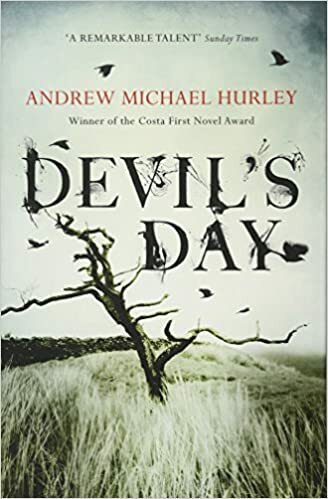 The Loney was one of my favourite novels of 2015 and went on to make the Booker longlist and win the Costa Book Award, so I had high hopes for Andrew Michael Hurley's second novel, Devil's Day. Like The Loney, it taps into a lot of themes and ideas I'm interested in, such as psychogeography, folk horror and rural isolation and also has a strong sense of eerie foreboding hanging over it, much of which comes from the landscape. I wasn't disappointed. John Pentecost, who narrates the story, is a Suffolk schoolteacher, married to a vicar's daughter, Kat, who is expecting their first child. When his grandfather, the Gaffer, dies John returns to the Pentecosts' family farm in the Endlands, an exceptionally isolated spot at the end of the Briardale Valley, over which the untamed moors loom. The Endlands consist of just a few families who have farmed for generations on land over which they are deeply territorial and which they seem to have acquired for themselves in slightly mysterious circumstances. During the summer, the Pentecosts' sheep roam freely on the moors, and are brought down in late autumn during 'Gathering'. The day before Gathering is Devil's Day, when the Endlanders reenact a number of rituals said to protect them and their farm from the Devil himself, who supposedly lives on the moor and about whom there are countless local legends. Are these just folk tales to entertain children, cautionary tales about the dangers of wandering on the moors? Or is there something out there that the Endlanders genuinely fear? Devil's Day is an unsettling read that chilled me to the bone, full of ambiguity, brutality, and brooding atmosphere. It's clear that there is something amiss in the Endlands, but just what that might be is never confirmed, and it's left to the reader to make up their own mind. The landscape is described in rich detail by throughout and every feature of it is named in a way that's reminiscent of Alan Garner's Thursbitch. While the Endlanders have tried to shape the world around them by mapping and naming it, the landscape is clearly shaping them too, and has a strange power over them. John himself seems to undergo a gradual personality change during his stay, and the more determined he becomes to abandon his life in Suffolk and take on the family farm, the harsher his attitude to his increasingly frightened wife and the more dismissive he becomes of her concerns. John is a narrator who falls very much into the unreliable camp, and it's likely he's deceiving himself as much as he deceives the reader. If you are looking for pacy genre fiction full of action and shocks, you won't really get that from this novel; it's about far more than the supernatural and like The Loney this one is a richly descriptive, slow-build literary novel in which more is implied than expressed outright. For me, though, this is what makes it so special. Books that hold their own as horror fiction and easily rank alongside prize-winning literary fiction are few and far between and Devil's Day certainly ticks both those boxes for me.